The best fishing kayak should be affordable, easy to transport and easy to maintain. A solid kayak for fishing will also offer the angler a more stealthy approach to wary schools of fish much better than a boat with a trolling motor. Additionally, many anglers choose kayaks over boats because landing and catching saltwater and freshwater fish are more challenging. So, how do you make the transition from the average boat angler to the more challenging kayak angler, and what type of kayak works best? There are a few ways to go about picking out a fishing kayak and some important factors to consider before you click that buy now button, all of which we’ll discuss here. 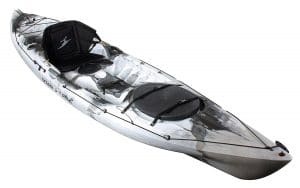 Sun Dolphin Journey Sit-on-top Fishing Kayak – A great deal for the price, this kayak comes loaded with plenty of bells and whistles and the lightweight design makes this one swift kayak that can get you where you need to go, quickly. Ultimately, this kayak is more designed for the beginner who’s interested in fishing in lakes or rivers, but it’s not a model that we’d recommend for serious saltwater fishing. Lifetime Tamarack Sit-On-Top Kayak – This kayak is designed for river or lake fishing. The lightweight design makes it easier to handle and transport, while the built in storage compartments allow you to carry all the gear you need for your next big fishing trip. Because many anglers felt that the kayak’s tracking ability left much to be desired, we don’t recommend this model for pro anglers. Ocean Kayak Prowler Fishing Kayak – A kayak that’s perfect for saltwater fishing, this model can take on the ocean or whitewater rapids with ease. For a model that’s designed with speed in mind, it surprisingly comes equipped with plenty of storage options, which makes it a great buy for the angler who enjoys longer fishing trips. The Sun Dolphin Journey 10-foot Fishing Kayak features a couple of flush mounted rod holders and an additional swivel rod holder. The spacious seating area and large open cockpit will allow for easier entry and dismount. The included portable accessory carrier can be towed behind the kayak, or worn as a backpack. The kayak itself measures in at thirty feet wide and ten feet long and is one of Sun Dolphin’s most popular models to date. The size of the kayak is enough to both maintain and pick up speed, in addition to offering more stability when fishing in rougher waters. The kayak is made from a durable polyethylene, which is one of the best materials to use, as it offers increased toughness and impact resistance. This type of material also allows the kayak to remain lightweight, so it’s easier to transport and get it in and out of the water. Overall, most users can agree that the Journey’s performance is nothing short of stellar. This model is ideal for rivers and lakes and will easily and effortlessly get you to your favorite fishing spot. When it comes to storage, the kayak features a bungee cord storage area located in the front, giving the angler plenty of access to essential tools. The kayak’s adjustable foot braces, protective thigh pads, and well-padded seat means that this model is very versatile and can fit users of any size. Many anglers felt that this model was a good choice for the beginner on a budget. There were some complaints that the hatches are not waterproof and other concerns regarding a lack of storage space inside the kayak itself. Anglers who purchased this model gave it an impressive rating of five out of five stars for the lightweight, tough design, pricing, comfortable interior and the overall quality. The Lifetime Tamarack sit-on-top fishing kayak offers amazing stability, spacious legroom, a large storage area and weighs in at only fifty pounds. This model is made out of high-density polyethylene and comes equipped with stability chine rails and deep hull tracking. The footrests are highly adjustable and able to accommodate users of different sizes. You’ll also find a couple of six-inch storage compartments, one of which is located in the center of the kayak, while the other one is placed in the rear. The kayak’s seats are highly adjustable, which is a must for longer fishing trips. This model comes with both rear and front handles for easier transportation. This is a model that was built with stability and safety in mind. It comes equipped with one-rod holder and features a flat stable bottom, with deep tracking channels. The multiple footrest positions are designed to fit riders of any size, so the kayak can be used by several members of the family. The seat back is heavily padded and allows you to enjoy a comfortable ride on longer outings. This model also comes with a five-year extensive product warranty. Some anglers felt that the boat’s tracking could be better. This model by Lifetime has a reputation for speed, durability, and comfort. The Tamarack is the perfect choice for fishing and recreation when fishing in rivers or lakes. It offers security, stability and a solid performance out on the water. It’s also priced competitively and offers plenty of extra features that make it worth every penny. Anglers who purchased this model gave it a high rating of four out of five stars for pricing, lightweight design, seating adjustability, and overall quality. The Ocean Kayak Prowler is a thirteen-foot fishing kayak with a fast performance hull and a large front hatch that offers easy access to stern and bow internal storage. The long length of the kayak works to improve tracking and provides the angler with improved hull speed compared to shorter kayaks. When fishing in a kayak, deck space is always an issue, but this model provides enough room to place a tackle bag or cooler in the rear. The storage compartments will prevent your gear from flying out as you easily slice through the water. The kayak’s interior contour shape works to prevent water from pooling inside the deck. If you’re one of those anglers that have to bring along a ton of gear, then you can also take advantage of the nice bungee strap system on the rear of the kayak. The included foot straps are highly adjustable and able to accommodate users of different sizes. This is one fast kayak that offers exceptional performance and tracking abilities. When you’re riding through rough conditions, the kayak remains stable. It’s also compatible with different Ocean Kayak accessories, so you can customize your kayak for improved performance. Due to its compact, lightweight design, the Prowler is a great choice for both beginners and pros. The kayak’s seat isn’t the most comfortable in the world, so we recommend purchasing a seat pad for those longer six or seven-hour trips. This model offers only one seating position. There have been reports that the side handles can break off when you’re loading the kayak if you’re not careful. This kayak can easily take on rough waters like a champ. The high tracking ability makes it the go-to model for anglers who enjoy saltwater fishing. We also loved the sleek contoured design that makes this kayak one of the fastest models in the water. Consumers who purchased the Prowler gave it a rating of four and a half out of five stars. Before you can determine the appropriate kayak for your particular fishing needs, you’ll first need to first consider what kind of fishing you’re interested in pursuing because not all kayaks are created equal. Because of this, you should be aware that kayaks for fishing are divided into a couple of distinct categories that consist of fishing in saltwater and fishing in freshwater. Additionally, both categories are divided further into offshore fishing and inshore fishing. It’s also important to understand that every model will present the user with different types of paddling conditions and requirements, so the angler will need to take into consideration the different options available. Still water can be found in any body of water that ranges in size from a pond to a large lake, but when paddling over smaller bodies of water, a lightweight, short kayak with a reputation for stability, not to mention a moderate degree of rocker, is usually the best option. Both sit-on-top and recreational models will work well in these water conditions. Fishing in large bodies of water will usually require the angler to cover longer distances in order to reach the best fishing locations. Once the angler has arrived at their destination, the space is relatively open, so when fishing in a larger body of water, speed is generally more of a priority than maneuverability or ease of transport, so a fast, slim, long sit-in model that features a lower degree of stability and rocker is the right choice for this type of fishing. When it comes to moving water, it can range from a sedate river to a fast flowing stream that comes complete with whitewater rapids. In these fishing conditions, a certain type of kayak is more suitable for fishing. But the one universal constant that goes along with picking out a model for fishing in moving water is that you may or may not encounter swiftly flowing water conditions. So, a wide, short, sit-in model that features a high degree of stability, soft chines, and a high degree of rocker will be the best option. However, there are some models of sit-on-top kayaks that can work for this purpose as well. Inshore waters involve any body of water that’s adjacent to the shore that has a depth of seventy feet or less. But with kayak anglers, inshore waters usually consist of saltwater marshes, creeks, estuaries, flats, sounds, bays, and inlets. Because the angler will often be required to paddle over longer distances and can also face steep waves or stiff winds at any time, a slim, longer kayak that comes with a moderate degree of rocker will work the best for this type of fishing. However, it’s also important to note that most anglers prefer sit-on-top models for this type of fishing because these models are unsinkable and can enable the angler to easily reenter the kayak if they’re pulled out of the cockpit or the kayak ends up capsizing. But on the other hand, common sense tells us that a slim, long, sit-in model offers a more efficient hull design compared to a slim, long sit-on-top model, and thus, a sit-in kayak is much faster, requiring less effort to paddle. Offshore waters are defined as water that features a depth of seventy feet or more. But for kayak anglers, this type of water means big skies and big water. An offshore angler will cover plenty of ground and can also expect to paddle over longer distances and face steep waves and harsh winds, so a slim, long kayak can provide much-needed security in these water conditions. The biggest difference between the sit-on and sit-in is that the sit-on models lack an enclosed cockpit. Sit-ons are also designed with drain holes found in the bilge. These drain holes will allow water that enters the cockpit to escape. Sit-on kayaks are designed with a double hull construction so there’s an enclosed air space located between the outer and inner hulls that work to trap air inside, making this style of kayak unsinkable. Additionally, most models of sit-ons are made from a tough molded polyethylene. As a general rule, sit-ons usually range from ten to sixteen feet long and have a pretty wide beam so they offer a higher degree of stability. Due to their extreme stability and wide open cockpits, they’re the most popular type of angler kayak around. Kayaks that are designated as recreational will differ from sit-on models in that they offer an enclosed, large cockpit with a moderate degree of rocker. This type of kayak works best in calmer waters. These models usually measure in at eight to fifteen feet in length. A day touring kayak is slimmer and longer than a recreational kayak and features a longer length of twelve to eighteen feet. Because this style of kayak is slimmer and much longer, they offer a hull design that’s more efficient than any other style of kayak. However, with this longer, slimmer design they also come with less stability, making them a better choice for long range fishing on offshore and inshore still waters. Determining the size, style, and type of fishing kayak will ensure that you enjoy your time out on the water, and more importantly, you’ll be prepared for whatever Mother Nature happens to throw at you, whether it’s high winds, rough rapids, or deeper waters. 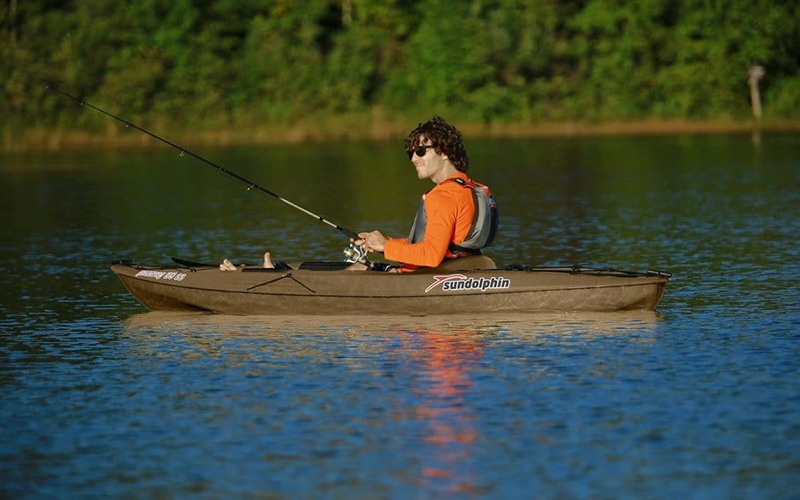 Before you buy your first fishing kayak you should also consider the type of extra features you may need, such as adjustable foot braces, storage space, seating conditions, deck space, and rod holders. We’ve reviewed the top three fishing kayaks on the market. Each model has something special to offer in terms of features, tracking ability, and space. Each of these models has also received plenty of positive consumer feedback so you’re bound to find the right model that can meet all of your fishing needs.